As surprising as it may seem, we’ve made a good deal of progress through this winter season! For those in our community who opted for a winter CSA share, how is it going? (There are only 3 distributions left, by the way!) The farm crew hopes that the experience has been great; from our perspective, this winter is already successful in terms of production, learning, and implementation of lots of new systems. It is a joy to provide such good food and to witness positive reactions from our winter shareholders. In order to be productive and timely in distributing great produce, we've worked out plenty of systems this initial winter that keep greens and soil warm [enough] and to maintain proper humidity inside the greenhouses. We are also concerned with challenges as simple as an extremely muddy (or potentially snowy) driveway. Compared to the summer season, weather-related complications are more likely during the winter, and we've already learned a lot about preparing for them and about responding to problems. With the exception of vehicles stuck in the mud, frozen pants, and an underground irrigation leak, these two cold months have been smooth and productive on the farm. These months have not been all cold and potential problems, of course. There are many friends! 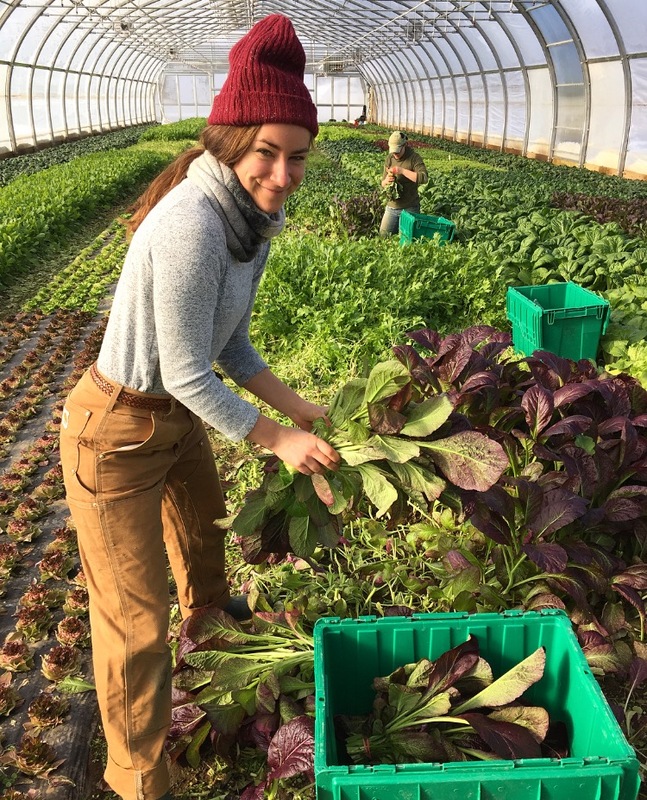 In the strong tradition of PFP, we are joined when we need the support by folks from the summer and from past seasons, helping us to complete big harvests of fresh greens (even on frigid days). This support has also allowed everybody to take vacations without holding up harvest, distribution, or maintenance. THANK YOU for your labor and for bringing extra warmth to the greenhouses! The farm, covered in a light blanket of icy snow, is quite a peaceful place this time of year. The farm crew continues to tend the greenhouse beds and focus on the winter CSA, while also transitioning into planning mode for the summer growing season. The new greenhouses will bring plenty of change to the summer season, too, so look out for updates soon! We'll have plenty to share.